Now that I've paid for my Disney vacation AND my air fare, I can look at those few things I want to get to make the vacation more exciting. The last time I went to Disney, your park admittance was on a card, similar to the one I'll use to get into "Mickey's Not-So-Scary Halloween Party". But, in the intervening years, technology has improved, as we know, in leaps and bounds and now, Disney uses Magic Bands. Your admission, your room key, and your dining credits are all stored on a chip inside the band. You wear this everywhere; it's waterproof; and just swipe your arm when you need to do something. 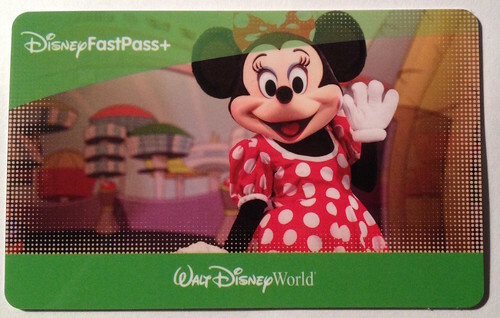 When I finally pick my FastPass rides for parks, those selections will be loaded onto my band. It's quite astounding technology. By staying in the resort, you get a free band. It's a plain gray color but it has your name on it. You can get other colors, but I looked at the plain colored ones and decided that wasn't what I wanted. Back at the beginning of the year, there was a band with the seagulls from "Finding Nemo". It said, "MineMineMine!" on it. You have to buy the special bands from the Disney Store and there are periodic sales. I decided I would wait and see. If there wasn't a sale on bands by August 1st, I'd buy one to make sure I had it in time. Amazingly, at the end of May, there was a sale on bands. But, the "Mine" band was nowhere to be found. My friend, Liz, said these specialty bands come and go. You know it's to drive purchase. If there is the chance what you want could be discontinued, you're more likely to buy it now. I had to "settle" for a Tigger band. The only thing you have with the free versus the paid for bands is that, once you get your band from the store, you have to link it to your account. It's a reasonably simple matter to log into your account and type in a bunch of numbers and letters to get it linked. The band came and the packaging felt a little strange. When I opened it up, this was the container for the band. It was all bent. This was kind of odd. 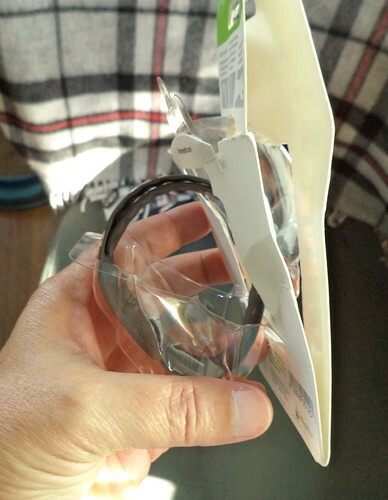 I turned it around to open the package. I could not imagine the post office, even running it through some heavy duty machines, could mangle the package like this. Clearly, this package had been opened. Well, as long I can link it to my account, I'm okay with it. So, I put it on. This is so cool! All my information will be contained on this wristband. I flipped the band over, located the 6 point type code and entered it into my account. Nothing. I got an error message saying the band had been assigned to another account. Wait? How could that happen? Maybe I "fat fingered" the code because it's so small. I tried twice more. Each time, I was told the band was assigned to another account. I called Disney tech support. They verified that it was linked to another account. They referred me to the Disney Store to get the band replaced. When I called them and explained the problem, the gal on the phone was speechless. "I...I don't know what to say, ma'am. This has never happened to me before. Magic bands are not returnable for this precise reason. They can't be reused once they are linked to an account. I will ship a new one to you right away. I am so sorry this happened." If you look at the bottom of the package, it says, "No returns, exchanges or refunds." She said my call would spur an assessment of how this could have happened. 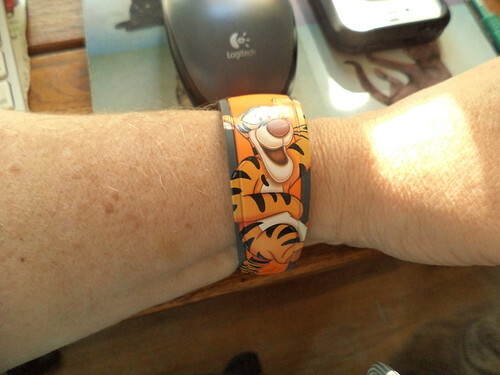 I remember reading, somewhere, when I bought the Tigger band, that Magic Bands were not returnable. Who knows how this happened, but I'm the one it happened to. 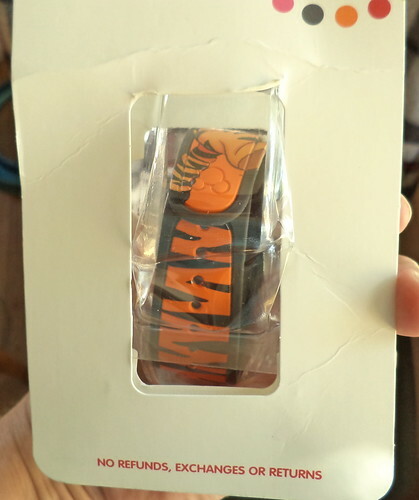 It took another week, but my real Tigger Magic Band arrived. Once I had it, I tried to enter the code, but, trust me, the code is in such small type, I had all sorts of difficulty. I kept getting a message that the code didn't exist. Another call was placed to Disney. Fortunately, we determined the "8" was a "B" and the tech support gal was able to attach the band to my account. I know I tried typing the "8" as a "B" because I wasn't sure which it was, but the web site claimed not to recognize the code. I'm excited. Disney said I can do with the other one whatever I want to do. I'm not sure what that is. I kept it. The bands are cool. They are a malleable, lightweight rubber compound. Once you snap the top over the bottom, you aren't going to lose it, even if your wrist gets sweaty or you go into the pool. I'll enjoy wearing this for a week.